Whether you are doing an investigation or another type of project, make your display fun and engaging. In addition to all of your written work on the board, try to bring something for your visitors to touch or play with! Or if you're worried about your visitors damaging your things, then stand by your project during the fair and do a live demonstration! Choose a catchy, attention grabbing title that accurately summarizes your project. The title should be big and easily read from across the room. Organize your information like a newspaper so that your audience can easily follow the thread of your experiment by reading left to right, top to bottom. To make the various elements stand out, use contrasting colors. You can also use foam mounting squares to give them a 3-D effect. 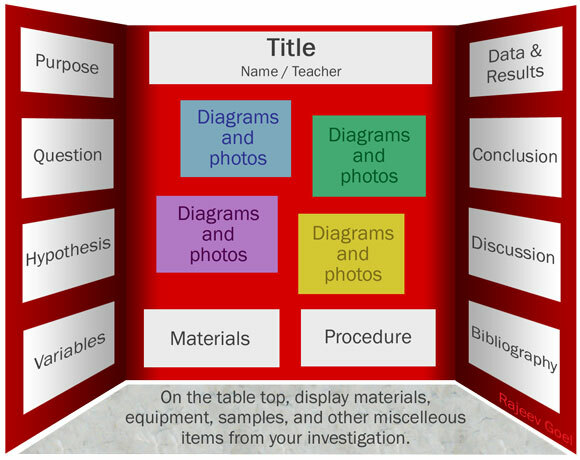 Take photos of your investigation, and use them on the display. Also write short captions for each of your photos. Check out the Discovery Education site and the Science Buddies site for more great presentation tips. Note that by default, you will have 3' x 1' of table space to display your project. If you would like more space, or have other special requests, it's not a problem, but please make a note of it when you fill out your registration form. For 5th graders, or other students who are doing an investigation project, below is one suggestion for the layout of your project board. For more details on what each section is about, visit this page.